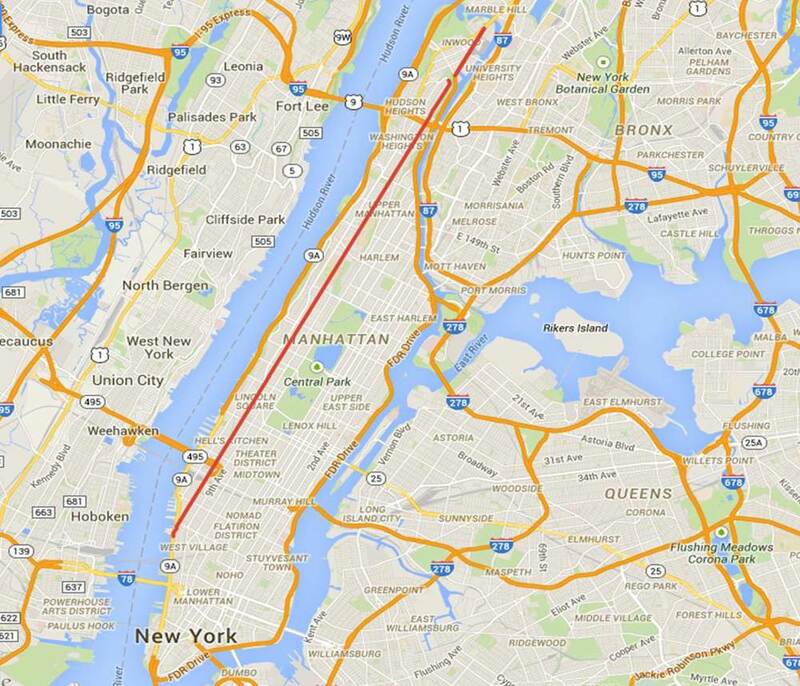 Off-setting the shortness of 11th Avenue is 10th Avenue, which runs more than 10 miles from 218th St. in Inwood to Gansevoort Street in the West Village. Like all the other avenues west of Central Park, 10th Avenue is also known as Amsterdam Avenue north of 59th Street (except for its final stretch in Inwood between Dyckman Street and 218th Street). I'd always wondered why the West Side avenues all lost their original names above the park while the East Side avenues all retain theirs, and it turns out the answer is very simple: Real Estate Developers. As the Upper West Side began to develop in the late 1800s, the people building and selling housing didn't want the new addresses to be associated with the tenements and factories to the south, so 8th Avenue became Central Park West, 9th Avenue became Columbus, 10th Avenue became Amsterdam, and 11th Avenue became West End. 10th Avenue runs through a number of neighborhoods and historical sites, but I've written about most of them before, so here are some pictures. 10th Ave at 218th St.
10th Ave. btw 216th St. and 215th St.
10th Ave. btw 207th St. and 206th St.
Amsterdam Ave. at Ft. George Ave.
Amsterdam Ave. btw 188th St. and 187th St.
Amsterdam Ave. btw 180th St. and 179th St.
Amsterdam Ave. btw 175th St. and 176th St.
Amsterdam Ave. btw 168th St. and 167th St.
Amsterdam Ave. btw 165th St. and 164th St.
Amsterdam Ave. btw 159th St. and 158th St.
Amsterdam Ave. btw 152nd St. and 151st St.
Amsterdam Ave. btw 146th St. and 145th St.
Amsterdam Ave. btw 123rd St. and 122nd St.
Amsterdam Ave. btw 113th St. and 112th St.
Amsterdam Ave. btw 111th St. and 110th St.
Amsterdam Ave. btw 96th St. and 95th St.
Amsterdam Ave. btw 97th St. and 96th St.
Amsterdam Ave. btw 94th St. and 93rd St.
Amsterdam Ave. btw 80th St. and 79th St.
Amsterdam Ave. at 72nd St.
Amsterdam Ave. btw 72nd St. and 71st St.
Amsterdam Ave. btw 66th St. and 65th St.
Amsterdam Ave. btw 64th St. and 63rd St.
10th Ave. btw 55th St. and 54th St.
10th Ave. btw 47th St. and 46th St.
10th Ave. btw 46th St. and 45th St.
10th Ave. btw 39th St. and 38th St.
10th Ave. btw 35th St. and 34th St.
10th Ave. btw 26th St. and 25th St.
10th Ave. btw 24th St. and 23rd St.
10th Ave. btw 22nd St. and 21st St.
10th Ave. btw 17th St. and 16th St.
10th Ave. btw Little W 12th St. and Gansevoort St.